It’s a long weekend over here, Monday being a holiday (well, not for me), and Halloween looming ahead, so I can feel the buzz of planning all about. Many I am sure are escaping the confines of the city, but we have decided to lazily stay put. The streets are pleasantly quiet for once and I feel I have hours before me to fill with all manners of puttering and weekend idleness. And although I love to travel and explore, I also love (and probably more so now that I have children) that decadent bordering on guilty feeling of having a free patch of time to just be. Our apartment building held a little trick or treating for the children yesterday, which they do every year, and we decided to plan a simple film-showing with snacks afterwards. Everyone pitched in and I am proud to report we had a good bunch of happy kids, satisfactorily stuffed, sprawled in our lobby, watching Hotel Transylvania. These cookies were my contribution (along with a batch of these too). This is basically just this dulce de leche spread in the middle of two of these brown sugar cookies. So simple to make because both can be done in advance. Well, to a certain extent at least. 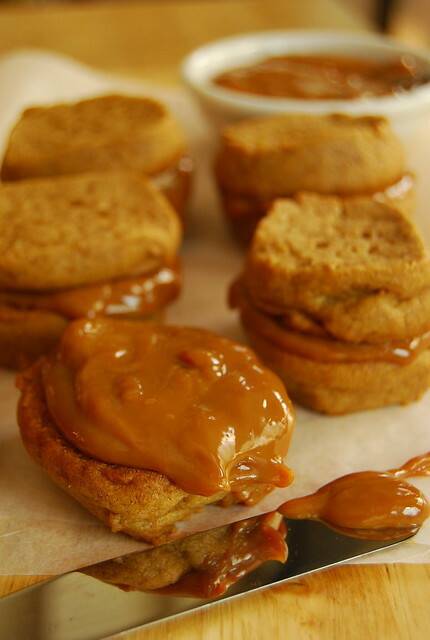 The dulce de leche can be done well in advance. In fact, I like to make 3-5 cans (what can fit in my biggest pot) and have these stored in my pantry for any sort of challenge in need of a sweet solution – which is, let’s face it, most. The cookie dough can be frozen (I like to think of my freezer as an extension of my pantry) in logs, and subsequently sliced and baked when needed. With Halloween treats, and the kids of our building, taken care of, I am now languorously cushioned in bed for a few golden moments of blog catch-up before throwing together some sautéed sausages for an impromptu neighborly get-together in our flat. Tomorrow may see us at a barbecue with friends…kids playing and dog yipping. More low-key yet high-pleasure activities (at least in my book). Hmmm…maybe I can make something for that as well. I should have gotten that skirt steak I saw at the grocery. Ah the luxury of time and choice! Not one I take lightly. I might even have time to make a batch of granola…a girl can dream! When you freeze your cookies, do you thaw the roll out then slice off the amount you want and refreeze? Or exactly how do you bake the cookies after they've been frozen? I've been using my pressure cooker to make dulce de leche and it only takes 15 – 20 minutes. Quicker to get to that yummy indulgence. p.s. just put a folded teatowel in the bottom of yr pressure cooker. I need help promoting my blog. How did you start? This looks so yummy. I will certainly try this soon. Love dolce de leche! Can't wait to give this a try.